"A PASSAGE TO OTHER WORLDS"
Medium : Jorge Raul Olguin. Entity that came to talk:Master Ruanel. 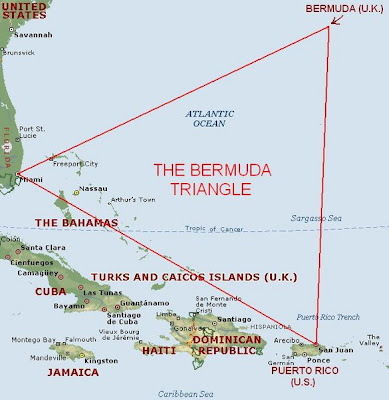 Interlocutor: What is the mystery about the famous Bermuda Triangle? Interlocutor: Can you explain it better Master? We already know that there are 22 parallel universes... I’m not going to continue since the vessel is destabilized. I’m going to give a final message: you must always keep fighting, fear must be banished and above all things the scenarios must be clarified, each person who has an engram or a restimulation should be treated through audition. Whenever a person has psychic attacks you should address the situation through spiritual treatments and do it as soon as possible because every minute that one lives with restimulations and psychic attacks affects more the psychic, astral, mental and causal parts. I leave you with a big hug. Interlocutor: Yes That’s correct and I am going to ask you. First I want to know about The Commander Lt. Taylor who was in charge of the Flight 19 that disappeared on December 5, 1945 with his airplane and the whole crew in the Bermuda Triangle. Was he abducted by aliens? Johnakan Ur-El: These people have gone directly through a Dimensional portal and they have gone to other worlds, because each one of them, and with all respect for their families, they had problems impossible to overcome and there was even one of them who had a terminal illness not yet detected by doctors. I say not detected by doctors, but it was in his genes, because genes are “programmed" from the birth and they have the information about how long that person's life will last. Interlocutor: Was it a karmatic meeting of all the members of the crew? Johnakan Ur-El: It was necessary that they fulfilled missions in other planets and in those worlds they were set free of the physical problems they had, as well as others who had unsolved problems in their spiritual part so they were appropriately reeducated. Interlocutor: But they went to those worlds with the same age, keeping intact their earthly memory? Johnakan Ur-El: Yes, their memories were not deleted and of course they are still alive in those worlds. Interlocutor: Could we know where they went? Johnakan Ur-El: Yes, they went to the 6º planet of Betelgeuse. This star is so big that , for example if you were at 150.000.000 kilometers, as you are from the Sun, you would be totally burned to ashes. Interlocutor: How many times is the star Betelgeuse bigger than our Sun? Johnakan Ur-El: Approximately 400 times bigger than the Sun of this system. And the 6º planet is at a distance from Betelgeuse similar to the distance that exists between the Sun and Saturn. Interlocutor: What was their reaction when they saw they have been transferred suddenly to other world? Johnakan Ur-El: For microseconds they panicked and they felt a feeling of uncertainty , but automatically - I will explain it in a very basic and understandable way -, it was as if a light beam had reached them, something like a soporific energy calmed them. They received, not by imposition - because in the spiritual world nothing is imposed- it was like a spiritual treatment and then, once they recovered their conscience and their analytic power was complete again, they met beings of Light who explained to them that they were going to make a great mission. Interlocutor: But didn’t they revolt against them? Interlocutor: Could we know their names? Johnakan Ur-El: I’d rather not say the names because there are descendants of those families and they could have a bitter feeling if they know this. But practically the bound between these two families was not going to have a good end... This is something that can only be done by higher entities of Light as a Dimensional Logos: they saw, as if it were a movie, what it would have happened to them if they had stayed in their world. And their future was so dreadful that they accepted their new fate that they offered to them. One of them asked, with a great philosophy, why they didn't allow them to complete their karma if it was a lesson to learn. And the answer was that the lesson to learn was already assimilated and they were directly on mission. Interlocutor: And Was this all that happened? Interlocutor: Isn’t there anything more to add? Johnakan Ur-El: No, everything has been said. The base of Grupo Elron are the teachings of the Masters of Light and they don't make mistakes on these topics, if you really think that methane bubbles are the cause of the dissapearances, you should follow their explanations and nobody will even try to convince you otherwise. Okay, I don't remember the number or ships and airplanes that have dissapeared in this region, but if they tried to find the debris of these ships, they wouldn't find the 10% of the missing ships or airplanes. This entry was posted at Monday, August 10, 2009 and is filed under Mysteries and Enigmas . You can follow any responses to this entry through the .